While certain aspects of your Booktype server's appearance and front page can be adjusted in the Control Centre, some organisations with Booktype deployments will wish to have a deeper level of customisation. As a web application, the appearance of Booktype can be themed in the same way that you might adjust the appearance of any dynamic web site, by editing templates and changing static files. Because a single Booktype server can host multiple instances, each instance can have its own unique theme. The following examples assume that the Booktype software has been downloaded to the /usr/local/src/booktype/ directory on the server, and a Booktype instance has been installed in the /var/www/booktype/instance1/ directory. The different paths of these directories mean that Booktype instances can make use of both default and customized templates, as required. If a particular template does not exist in the custom directory, the default template of that name will be used. Therefore modifications to a default template will be displayed on all instances which do not have a custom version of that template. depending on the virtual host configuration alias used for the /static/ directory. You can save the file by pressing Ctrl+O and exit the nano editor by pressing Ctrl+X on your keyboard. After saving the template file, refresh your web browser to see the change in the template. Saving the CSS file and refreshing the page will enable you to see the new style, unless the CSS is cached. before you can see the effect of the change you have made. You may also need to clear your local browser cache of CSS files. For example in Mozilla Firefox, the local cache can be cleared on the Privacy tab of the Preferences window. It is possible to create entirely new template files for Booktype components, by using the default templates as a guide. 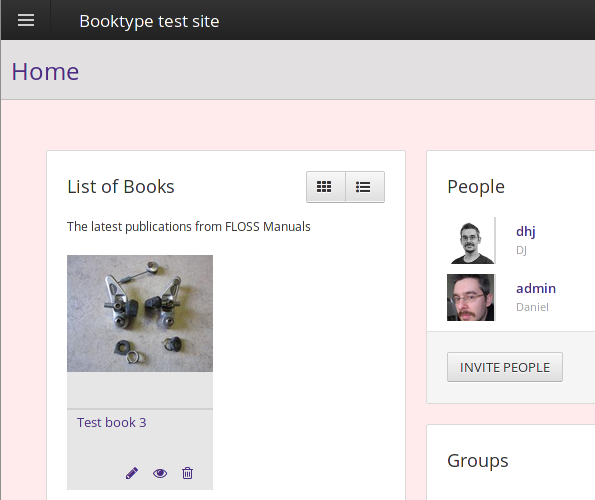 For example, Booktype uses a component called reader to present books on the web. The default templates for this component are in the /usr/local/src/booktype/lib/booktype/apps/reader/templates/reader/ directory and custom templates for it would be be copied into the /var/www/booktype/instance1/instance1_site/templates/reader/ directory. Looking at the beginning of the file /usr/local/src/booktype/lib/booktype/apps/reader/templates/reader/book_full_view.html we can see some of the key features of this template. It begins by declaring that it extends /usr/local/src/booktype/lib/booktype/apps/core/templates/core/base.html - the template which sets up the <html>, <head> and <body> tags of the output page, in addition to placeholders for blocks within these tags.